Prep medium-hot charcoal or gas grill fire. If cooking on stove-top use a cast-iron or non-stick pan and heat prior to cooking. Combine yogurt, chipotle, garlic, and ¼ tsp salt in a small bowl. Set aside at room temperature to let the flavors meld. In a small bowl, mix the olive oil, cumin, red chili powder, ½ tsp salt, and ¼ tsp pepper. Rub this mixture on all sides of the steak. Let steak sit for 15-30 minutes. Grill the steak and peppers at the same time. Grill the peppers on high heat until outside is completely black (looking almost charred), remove, and place in brown paper bag to steam for up to 15 minutes. Grill the steak covered**, flipping once, until medium rare, approximately 3-4 minutes per side. Transfer the steak to a large plate and let rest covered for at least 5 minutes. **Searing in pan might splatter. Grill red onion (or sauté in same pan) for 3-4 minutes and remove from heat. Set aside for garnish. Peel the peppers, chop off the stem, and cut into thick strips (approx. 3-4 per pepper). Skewer steak and peppers ( 2-3 per skewer) in ripple pattern – swirl sauce on plate, place skewers on top and accompanied with grilled onions, lettuce, tomato, and avocado. Serve with white corn tortillas brushed with clarified butter and grilled. Option instead of tortillas, serve with 2 baked plantains or an ear of fresh grilled corn. For more Seasonal Summer Menu recipes email [email protected] Please share any of your personal variations. I look forward to hearing from you. 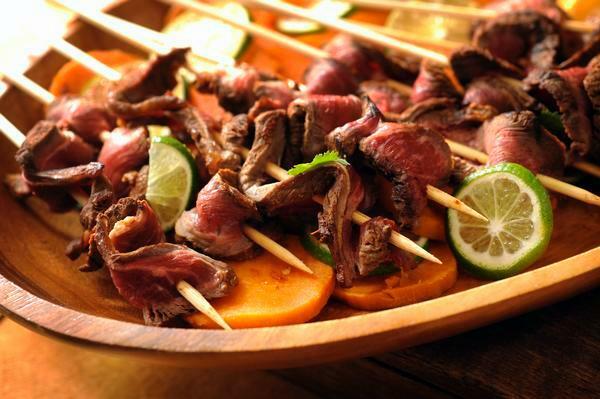 This entry was posted in Healthy Lifestyle, Recipes and tagged food, grill, Healthy Lifestyle, Recipes, steak, summer.